Sanctuary Spa was founded in 1977 by US choreographer Gary Cockerill for his love, his ballerina wife. Gary wanted a sanctuary that his wife and her ballerina friends could go to, to restore their weary bodies and muscles, but also a spiritual sanctuary for woman-only. How cute is that? What true love there. 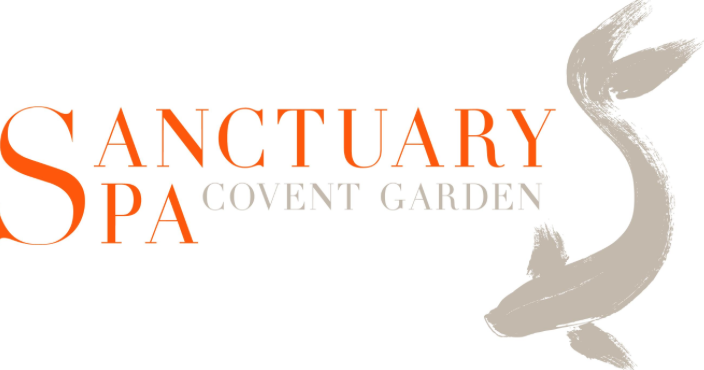 In 2012, Sanctuary Spa hit Australia with a range that allowed women to recreate the Sanctuary Spa experience at home. Sanctuary Spa have an extensive range that covers body butters, creams, scrubs and masks that are used within their spa to leave your skin perfectly polished and gloriously moisturised. This was the first time I was introduced to Sanctuary Spa as a brand. All I knew when I first received these gifted products was that they were from a skincare line. I've said it in the past that I'm still not a very huge person with a line full of skincare to use daily but since I have been blogging I definitely know a few more things and have added in a few products into my normal daily routine. An exfoliator is always on my list, when I was going through high school puberty I had the worst case of blackheads on my forehead and leading onto my nose. After being recommended by my older cousins that I should use an exfoliator I have never looked back. It's a must to my routine. Which when I had a facial examination they said I had really good skin and would age well, I guess the exfoliating daily seems to be working for me. I know that you aren't meant to exfoliate daily and I have cut back a little and do it every second or third day now as apposed to daily when I was told of the benefits of not doing it daily. Finding a good exfoliator can be hard, well for me anyway. 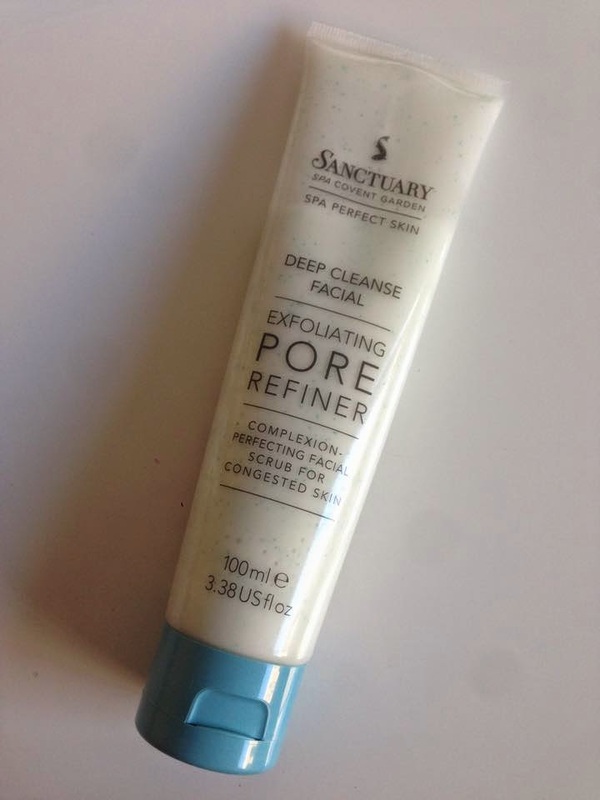 I require so much in a product and I think Sanctuary Spa have really produced a product that I am completely happy with and don't find flaws with at all. 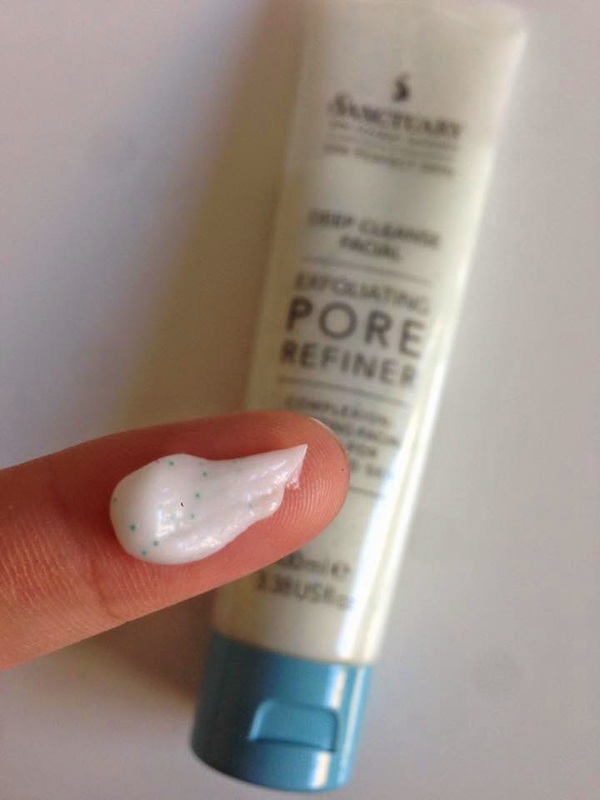 The exfoliating micro-beads (little green dots you will see in the photo) that scrub your face from the Exfoliating Pore Refiner (RRP $19.95) are like sand at the beach rubbing across your skin, they're a perfect gentle but very thorough scrubbing aid. The scent isn't too strong and is a sweet light scent. The packaging is perfect for the product with a flip and squeeze system happening from the stand base of the exfoliator. It's easy to use and it a good sized product to grab ahold of. The product is really easily rubbed into your skin; within three (3) circular motion rubs the white cream is nearly all worked into the skin. It's non greasy and refreshing on your skin. This would be a product that I recommend to anyone who suffers from congested skin - even those partners who work outdoors or on building sites. The dirt that would fall onto the skin would be building up a big mess on their skin and having an Exfoliating Pore Refiner would be a good key product to help keep their skin fresh. A huge product that nearly everyone I know sticks by is Witch Hazel and this Exfoliating Pore Refiner contains that, which helps to minimise the appearance of enlarged pores. 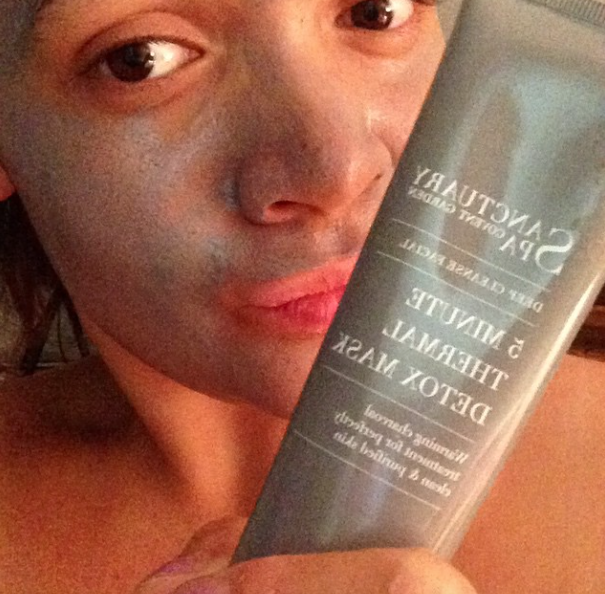 After using the Exfoliating Pore Refiner my skin feels fresher and like it has undergone a mini facial at a day spa. The skin feels brand new, so soft and subtle like a newborn babies skin. The cold days are ahead of us, out come the hot water bottles and the cranking of the heater but what about our face. How can we get these heated up there? 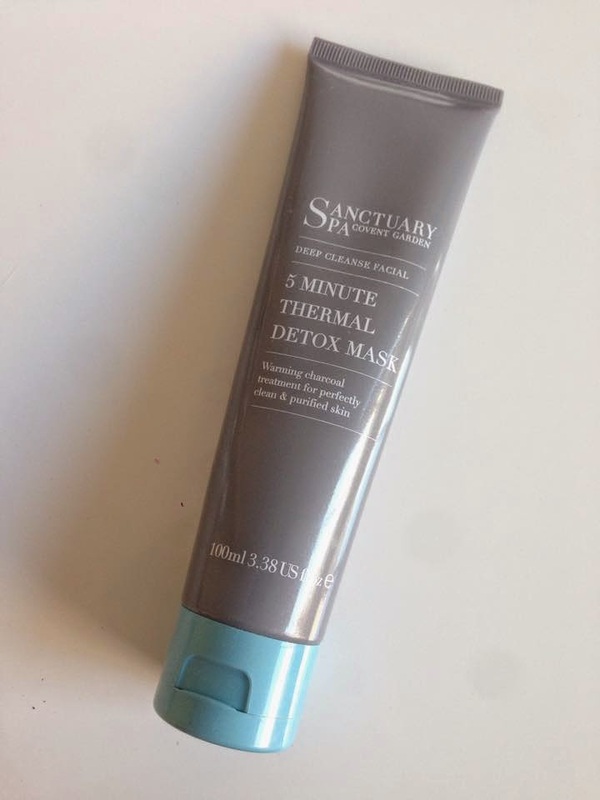 Sanctuary Spa have an amazing product called 5 Minute Thermal Detox Mask (RRP $19.95) that I absolutely adore on those cold nights. 5 Minute Thermal Mask is a face treatment that you leave on your clean skin for 5 mins letting the mask clean and purify the skin. This mask works as a 'thermal' by the warmth of your fingers rubbing it together which then activates the mask cream and feels like your having hot steamy water running over your face from the shower. A thick grey charcoal like colour will cover your face as the mask is applied, then 5 minutes of relaxation should take place afterwards. 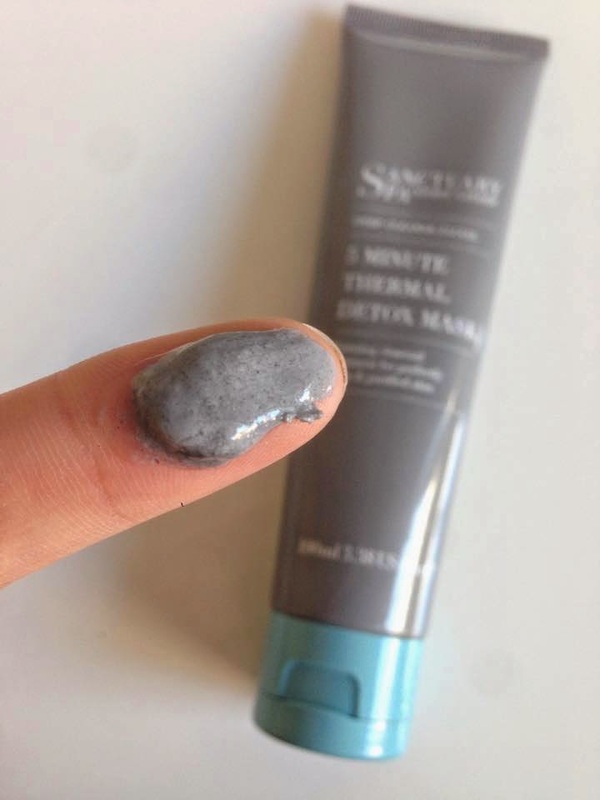 Whilst you are waiting the 5 minutes the mask is opening up the pores in which then the charcoal and kaolin clay help drought the impurities from deep within the skin. The scent that comes off this product I would have to say smells like play dough and clay. You will only require a thin layer of this product all over your face. Within 20 seconds of rubbing the 5 Minute Thermal Mask into your face you will start to feel the warmth sensation. The mask does feel a little tight and sticky whilst on your face but that is completely normal and your skin will go back to normal after you have washed the product off. After you have taken the mask off you will notice an instant change in the texture of your skin - the areas you have placed the mask will be a lot smoother and hydrated. **Product was gifted in exchange for its review here. All opinions are my own and I have not been advised what to write.